I am trying to set up "school" pref for my laptop. I have set my laptop for "school" on all it's projects and have set up "school" for general and project specific. When I do an update, it still wants to use "home" settings. How do I get the laptop to use the "school" settings? > How do I get the laptop to use the "school" settings? Some versions (I think 4.19 is one of them) don't create the host_venue tag in the client_state.xml file. There is a newer version available that does do this, or you can manually edit the file to add the tag. in the client_state.xml file, one line above the last line of the file. which when I edit it to be school, will change back to home on the next update. Why would it change back to home? > Why would it change back to home? 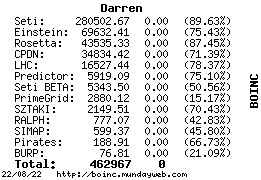 Did you shut boinc down when you made the changes? If not, an update won't change it. If you shut it down, make the change, then restart it, it should start back up using the "school" settings. As long as you have your school settings defined, you can then update it and it should stay set to school. It should only go back to home if the school settings aren't defined on the project server.